Update: The recipe could not be simpler. Before you poo-poo it for containing ketchup, understand that this isn't some "cream of mushroom soup" thing-- you'll never know it has ketchup in it. Season the chicken liberally with the seasoned salt, making sure to get plenty under the skin. Mix the onion, ketchup, and water in a baking dish. 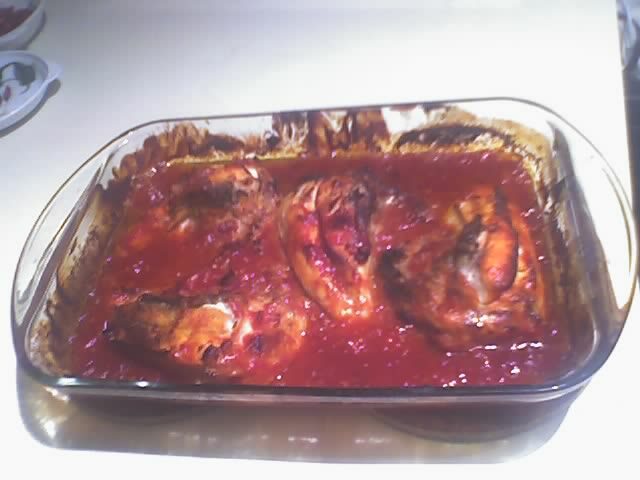 Smear some of the ketchup mix all over the chicken, and place the chicken in the dish, bones down. Bake for 30 minutes at 350, then flip the chickens so the bones are up and bake for another 30 minutes. Serve with rice and a salad or steamed broccoli. I go through a lot of rice once I start mixing it with the sauce. This is the simplest version of the recipe-- it works well with a basic marinara instead of the ketchup, and I sometimes add a few cloves of garlic, chilies, and celery.